About Us | Numerequip, Inc.
Numerequip, Inc. was founded in 1978 as the Mazak Distributor for Northern Ohio. 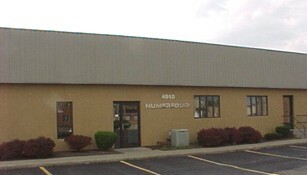 In 1983 Numerequip moved to our present location, 4810 Briar Road, Cleveland, Ohio, to facilitate a mini Technical Center with Customer Applications and Training support. In 1991 we doubled the size of our building to support production-ready capabilities. Numerequip's mission is to "FOCUS" on a very few, high-quality lines that share similar traits of excellent service, excellent replacement parts availability; and, continuously innovative and diverse product lines. Numerequip is a "Rock Solid" organization. Our average employee has 18 years of service. We have been at the same location for 34 years and have represented Mazak for 40 years and Star CNC for 12. 80% of our business volume is a repeat customer with 50% of our new customers being referred from our existing customer base.